Being back from deployment, especially with a TBI, can be overwhleming and paying bills sometimes gets lost in the shuffle of treatment, recovery, school, work, and family. Adam recommends using automatic bill paying. Adam Anicich talks about why going to a restaurant post-TBI is often far from relaxing and what to do to make the experience better. Adam learned to implement his "four-finger approach" — something he learned in OT at the VA — so he never forgets his wallet, keys, cellphone, and sunglasses. New appliances, like Adam's microwave, come with all sorts of buttons, displays, and settings. Heating up rice for the first time is not always easy. After his brain injury, Adam had to create strategies to help him associate names with faces — from gleaning identifying factors in conversation to adding photos to his electronic contacts. One-on-one conversations are easy and fun, but for someone like Adam, who has a brain injury, being in a large group can be challenging. 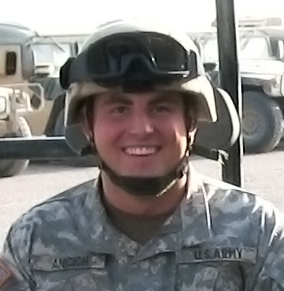 Meet Army Veteran Adam Anicich, our first video blogger. In his first entry, he talks about how his smartphone helped him get organized.